Goodboy Norman Featherstone: Let's Play! Hey, Woman! Let's play a little fetch. 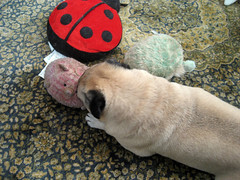 Pick a toy, any toy! I'll let you choose today! Not interested eh? How about this attractive Kitty? What would it take to put you in this Kitty today? Still not taking the bait I see. I guess I'll just lay here and groom Kitty. He is getting quite filthy. It must be all those trips outside he has taken lately. Aww poor Norman! I would play with you! I don't destroy my toys any more. I love them. I groom them and snuggle with them. Norman, I have a boy who would love to play with you. Nonstop! For hours! Are you sure you want him? You are such a Goodboy, yes you are! I like that squirrel that you have there. Maybe offer Woman the squirrel and she will play! Poor Norman!! I can't believe the woman wouldn't play with you!!! 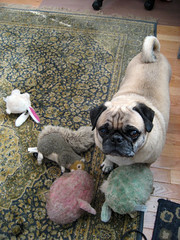 Oh Norman...you need a sibling pug...Sugar carries her toys outside, too. We still have Hedgie! (Hootie's cousin.) It's amazing how long those toys last...especially since Sela is always trying to get Winnie to play tug-of-war. 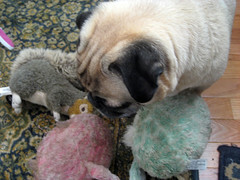 Winston loves on his toys now, too, like Norman.